PHOTO A: Lay out the legs and stringers. Scribe the curved end of the iegs and the curves on the stringers with a compass, set to the radii given in the technical drawings 011 page 300. 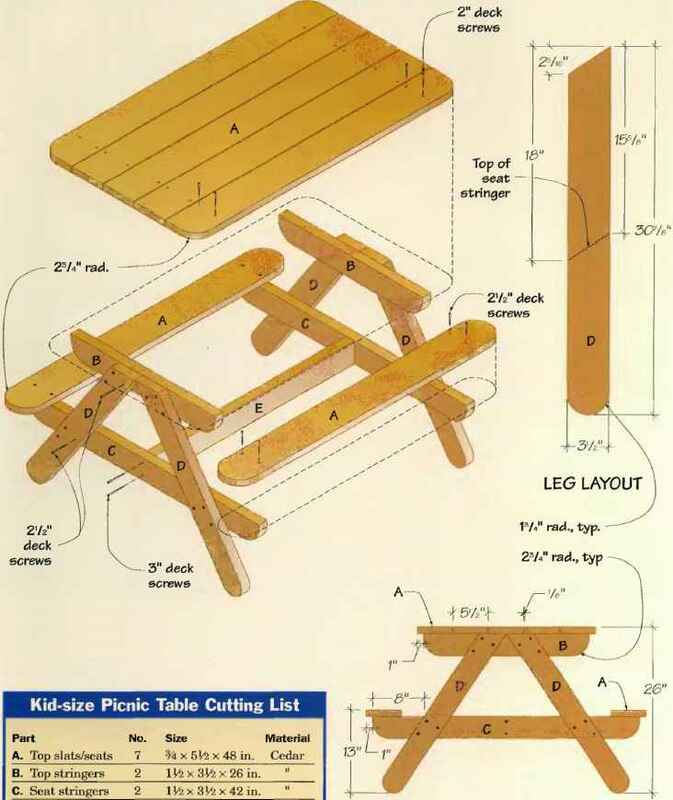 O Crosscut the legs, top and seat stringers and stretcher to length. Cedar is easy to cut with a jig saw, but you'll get straighter cuts using a circular saw. ©Lay out the legs; Refer to the Leg Layout dr awing, page 300, to mark one end of each leg for cutting tbe top angle. To mark the legs for curved feet, set your compass to a l3A-in. radius, and determine the centerpoint of the arc on all four legs. Draw the curved feet. flat to support either the seats or the top slats. Reset your compass to draw a 23/4-in. radius, and scribe the curves on the stringers (See Photo A). O Cut the legs and stringers to shape with a jig saw. 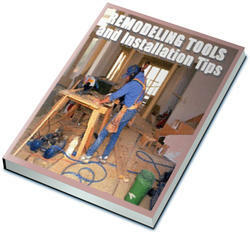 Guide the saw against a clamped straightedge to cut the leg angles. 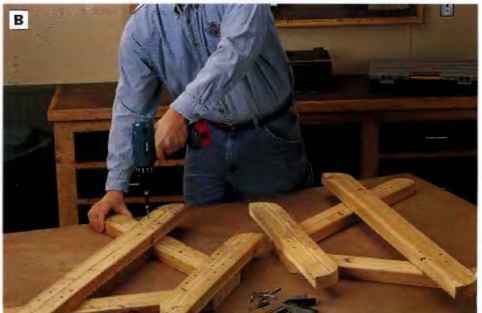 © Install the seat stringers on the leg assemblies: Mark the seat stringer locations on the legs, according to the Leg Layout drawing, page 300. Set the seat stringers on the leg assemblies so the top edges of the stringers align with the leg reference lines. Pivot the legs in or out slightly so the distance from the outside edges of the legs to each end of the seat stringers is 8 in. 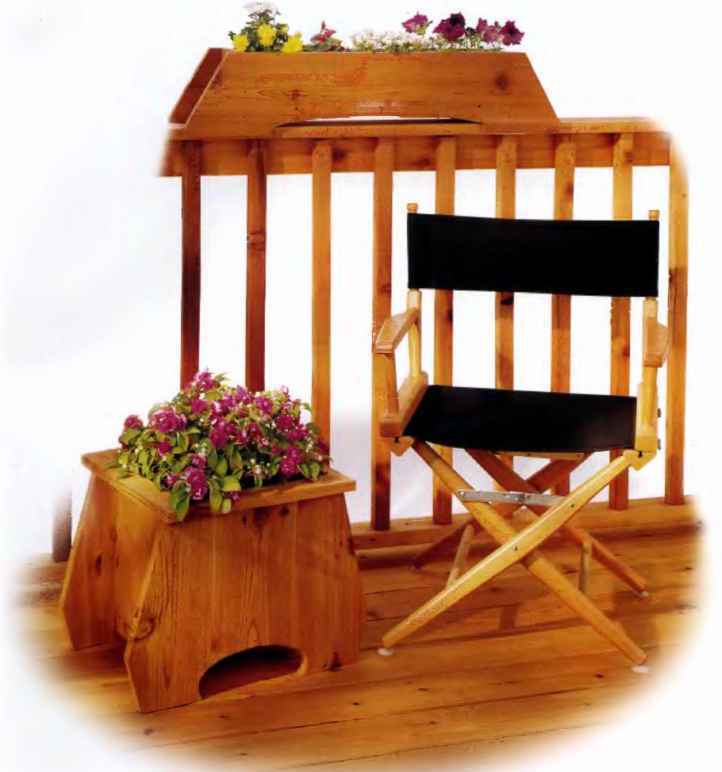 Secure the top and seat stringers with countersunk 2V'2-in. deck screws, four screws per joint (See Photo B). 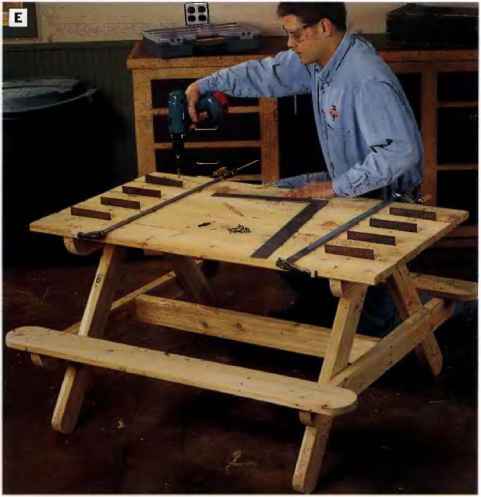 PHOTO B: Set pairs of legs on your worksurface so they splay outward with their angled ends aligned. Attach the top stringers flush to the tops of the legs, and Install the seat stringers so they overhang the legs by 8 In. on each end. Fasten the parts with countersunk 2Vi>-in. deck screws to form two leg assemblies. PHOTO C: Stand the leg assemblies top-down to attach the stretcher between them. 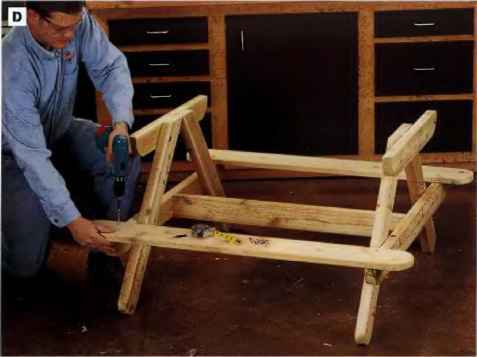 Hold the stretcher in place with clamps so It is centered on the length of the seat stringers. Drive countersunk 3-ln. screws through the seat stringers and Into the ends of the stretcher. PHOTO D: Set the frame upright on the floor to secure the seats into position. The ends of the seats should overhang the seat stringers by about In. Make the outside edges of the seats overhang the ends of the seat stringers by 1 In. PHOTO E: After setting the slats into position on the fop stretchers and marking alignment lines for screw holes, Insert spacers between the slats—we used Mi-ln. *thlck hard bo arc]. Clamp the top slats together to keep them algned, and fasten them to the top stringers with countersunk 2-in. deck screws. 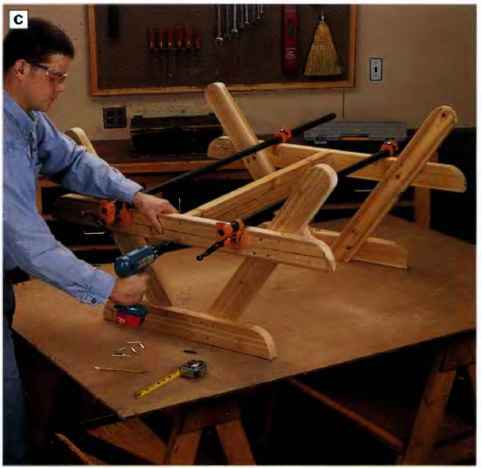 clamp the stretcher to the seat stringers so it's centered on their lengths. Drive pairs of 3-in. 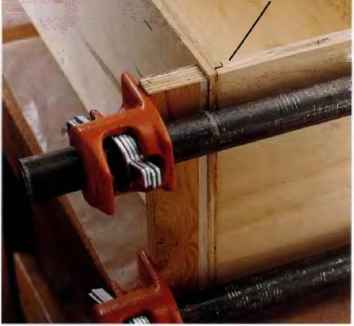 countersunk deck screws through the seat stringers and into t he ends of the stretcher to fasten the parts (See Photo C). O Crosscut the seats to length. © Scribe the rounded ends on the seats with a compass set to draw a 2%-hi. radius. © Attach the seats to the frame: The ends of the seats should extend past the seat stringers equal amounts on both sides (about in.). Let the outside edges of the seat boards overhang the ends of the seat stringers by 1 in. With the seats in position, fasten the parts with countersunk 2^-in. deck screws driven through the seats and into the seat stringers (See Photo D). 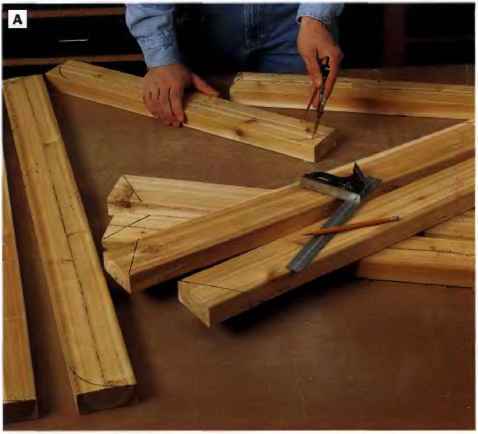 © Cut the five top slats to length and set them in place on the two top stringers so they overhang the stringers evenly. Don't worry about spacing between the slats yet. With a straightedge, draw lines for screw holes across the slats to mark the center!in es of the top stringers. PHOTO F: Mark a 234-Fn. radius on «ach of the four comers of the tabietop, and trim the comers with a jig saw. between your slats according to the boards you're using. Clamp the top slats together to hold them in place. Drill pairs of countersunk pilot holes through the slats along the stringer marks, and install the slats with 2-in. 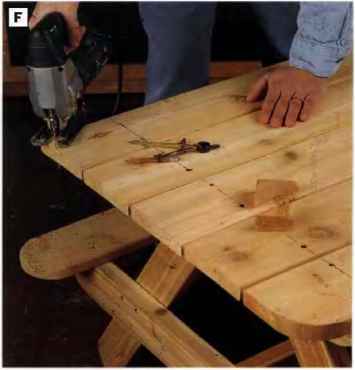 deck screws (See Photo E). ©Set your compass for a 2%-in. radius, and scribe corves onto the outer four corners of the table top. Cut the corner curves, and file the cut edges smooth (See Photo F). © Sand all exposed project surfaces with a random-orbit sander and 150-grit sandpaper (See Photo G). Editor's note: We left this project bare rather than finishing with an exterior topcoat, because most of these products aren't safe for use on eating surfaces. 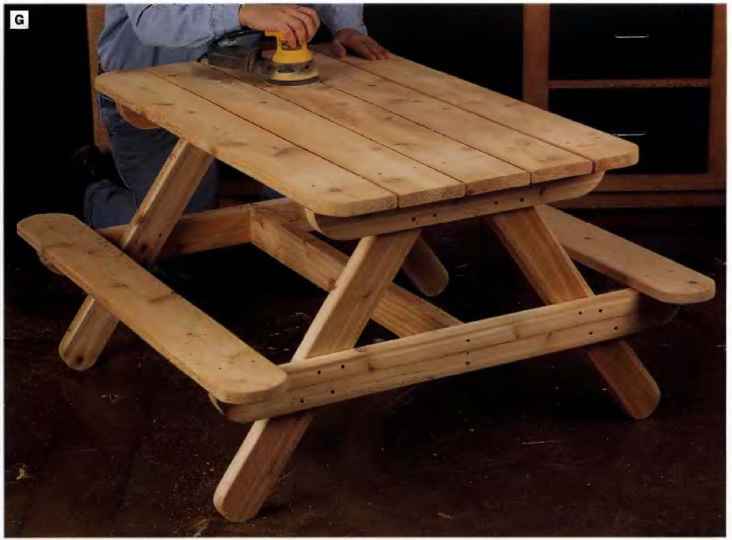 PHOTO G: Since cedar Ts prone to splintering, you'll want to give the table a good sanding to break the edges and smooth the parts. A random-orbit sander Is the best tool for the job. It's a good Idea to wear a dust mask when sanding cedar; the dust can be a respiratory irritant.